Today I managed to venture out into the garden! It was warm enough that I could stay outside for over an hour without being frozen to the bone! The garden was in much need of attention. There was a lot of dead material to remove and I wanted to assess the toll winter had on the plants. Sadly the Phlox did not survive the mould blight and I had to dig that up! I was pleased to find that the Cat Mint which I thought had died was in fact thriving. The Honey Bees will be happy! I cut away the dead branches and exposed the new growth. I also found that my Honeysuckle had lots of new leaves on and that the Hyacinth had flowered. I planted some bulbs while David tidied up the Passion Flower, which had grown wildly over winter. 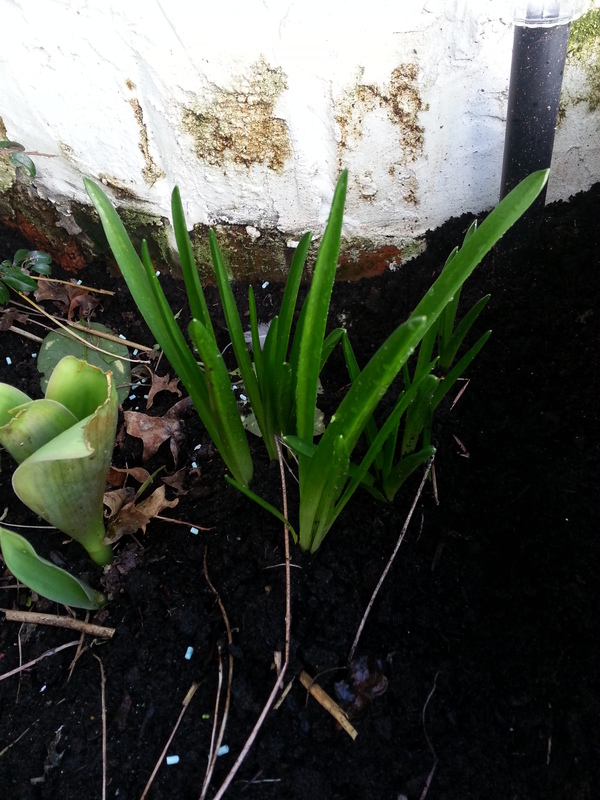 I planted Ornamental Lilies, Orchids and Gladioli. I just hope they flower. Talking of bulbs. The most successful of the ones I planted last year seem to be the Bluebells. I have counted 15 in total, though all there are at the moment are leaves. There has been no sign of the snowdrops, maybe next year? I was worried a little when designing the garden about the shaded side as it gets very little direct sunlight. I needn’t have worried as my Hellebore is blooming with some 10+ heads open/opening!! I also discovered that the Aubrieta was looking very green and the Aquilegia which I thought would not appear again is also sprouting through the soil! The plants in the garden still have a lot of growing to do, but I look forward to the lengthening and warmer days to come. I am positive my garden will soon be awash with colour, and that the bees and butterflies will once again enjoy my flowers!! I was looking forward to sending the long four day Easter break with David. I had hoped we would spend the time together, having fun. It was not meant to be. However the rest of the weekend was mired with worry over the living room fireplace, where David was trying to put his TV on the breast. He drilled in four holes for the bracket and found that behind was hollow with bricks falling down!! It did not help matters that I was snapping like a crocodile due to ‘that time of the month’ slowly approaching!